Microsoft have just announced the Xbox One S today at E3 , L.A. This diminutive piece of hardware will excite the storm trooper fan inside you as it now comes in an all new “Robot white”. 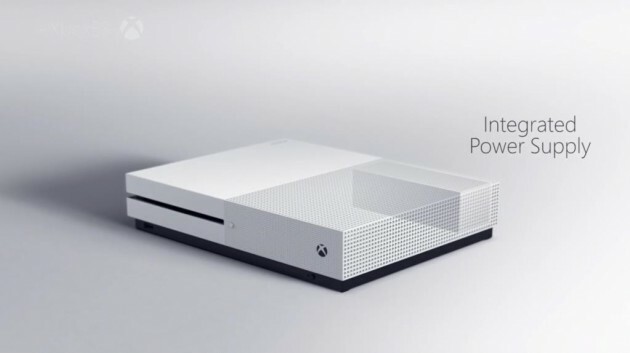 Its 40% smaller than the old Xbox. Make it just a tad bit thicker than the power brick of the previous model. Speaking of which, there is no power brick this time. The power source is built in, one of many subtle changes that Microsoft decided to make with this model. All you need is a cable. The controller has been changed slightly. Loads of tiny rubber dots cover the controller to provide better grip and comfort. The controller has better range with the addition of Bluetooth. The thumb sticks have been optimized a bit for better response as well. And yes, you guessed it, the controller is white too. Under the hood, there are changes too. Microsoft has now added HDR (High Dynamic Range) gaming. It now supports 4k ultra HD video playback and Blu-ray. It will come in 3 storage options at the time of release. A standard 500GB version for $299, a 1TB version for $349 and a special, limited edition 2TB version for $399. The new Xbox One S is slightly better it seems. In every regard. Nothing revolutionary. Just smaller, sleeker, minimal and modern. All your previous accessories will work with this one, not to mention games. Microsoft is keeping tabs on what people like and what they don’t. It’s nice to see they focus on the ergonomics and aesthetics of this console because more often than none it’s a living room appliance and it needs to fit in. Now it will. Not to say that the older one was ugly or anything. Novelty is much appreciated in the ever changing world of tech.